Installation of gas equipment for cars VAZ allows you to improve technical performance in terms of efficiency and quality of work of the engine. The decision on installation of the equipment should be deliberate and prudent, for it will make adjustments in driving style and some changes in terms of operation of cars VAZ. In addition, in case of impossibility of mounting the cylinder on the external parts of the body setting the volume of the gas cylinder will reduce the useful volume of the Luggage compartment. Gas tank, gas reducer, connecting pipes and hoses, of appropriate characteristics and diameters, gas valve with built-in dry filter, solenoid petrol valve, switch "gas-gasoline", mixer, external filling device, electronic control units feed gas mixture, solenoid injectors. Start by selecting the shape and capacity of the gas cylinder. There are two types of shapes of cylinders: toroidal and cylindrical. Choose the container depending on the desired capacity and design features of a specific model of VAZ. For example, for "Field" can be installed cylindrical container with a capacity of 70 litres under the vehicle, attaching it to the floor of the Luggage compartment, helping to maintain the useful volume of the trunk. 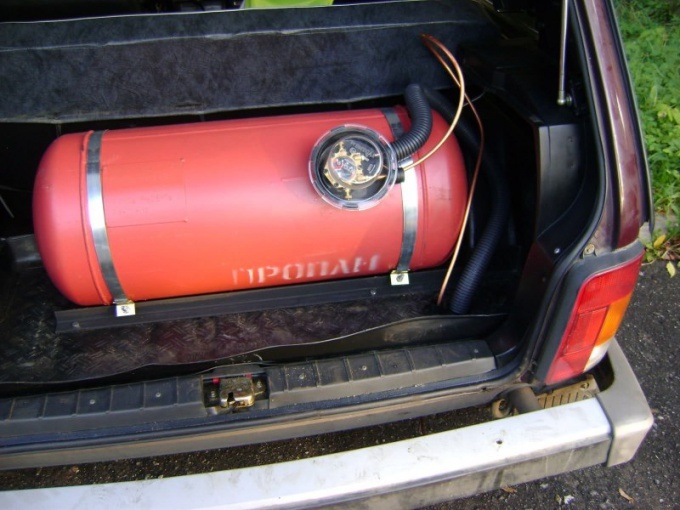 Toroidal tanks are the same shape wheel and installed in the spare wheel compartment of the car VAZ - this limits the volume of the container, but frees up space in the trunk. Select gas equipment corresponding to the type of engine of your car. It is divided into four "generations" according to the type of education and feeding the gas mixture. First-generation equipment designed for operation in the carburetor and simple injection engine model. The second is designed for installation on fuel injected engines VAZ with the catalytic Converter exhaust gases. Third generation equipment is composed of electronic control unit simultaneous injection of a mixture with dispenser-dispenser, and the fourth is equipped with more advanced electronic control unit solenoid valve injectors. Connect the built-in cylinder multivalve gas valve in the engine compartment brass tubing. Gas valve connect the pipe to the reducer-evaporator, and connect the flexible hoses to the mixer mounted in the middle part of the carb. Install the switch within easy reach to the controls of the vehicle and readily accessible to the driver. Install a petrol solenoid valve to the rupture of the fuel pipe before the carburetor. To install gas equipment of the third and fourth generations refer to the experts - it requires additional components and software that are difficult to install and configure without special skills. The main rules for the installation of the container – protection from outdoor sunlight, mechanical damage and a sufficient distance from the system exhaust. The gas cylinder must have a stamp containing the date of his examination. Remote filling device, depending on the location of the balloon is attached either to the rear bumper or directly to the cylinder or under the hatch filler neck of the fuel tank.